Wondering Where We’re Headed in 2019? 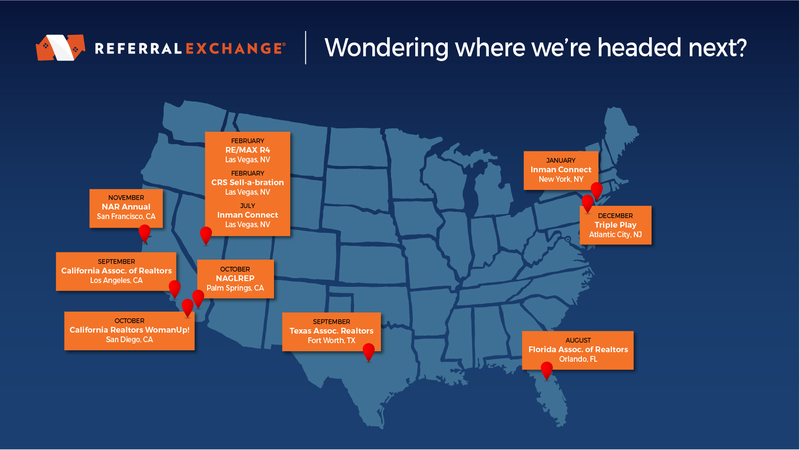 With a new year comes a fresh schedule of real estate events – a chance for us to meet new people, catch up with old friends and connect with the talented agents in our network all over the country. Check out this full list of major industry events from Inman News. If you’re attending any of the below conferences, drop us a line at marketing@referralexchange.com. We’d love to connect! Want more time to build relationships that grow your business? ReferralExchange verifies your leads and referrals, nurtures and gives them back to you when they’re ready to transact, and matches those clients outside of your area, price point or property type with three great agents.